The Smoke On The Mountain Show is one of the shows in Branson that you shouldn’t miss to watch as they perform at the Little Opry Theatre in Branson’s IMAX Entertainment Complex. You’re sure to enjoy the show as the talented members of this singing group perform hilarious Gospel musical comedy. A one-of-a-kind entertainment in Branson, Smoke on The Mountain will let you travel back in time where the audience plays the part of the Mount Pleasant Church’s 1938 congregation. This interactive musical comedy will feature music, comedy – and you. 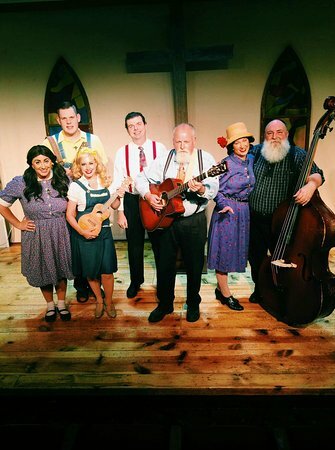 You’ll hear gospel songs such as ‘I’ll Fly Away’ and ‘Church in the Wildwood’ along with the comedic antics of the actors who portray the black sheep in each of the families. If you want a show that is something unique, this is exactly what you’re looking for. Smoke on the Mountain is a popular play that has been presented on many stages around the country, and now it can be seen in Branson. The story of the play has become a favorite of many audiences, as evidenced by great reviews of the production on the east coast by huge media outlets. The show have been enjoyed by sophisticated audience that went simply wild as featured from the Philadelphia Daily News and from The New York Times. The New York Post described the show as “A charming and funny celebration of Americana” – totally beguiling of its foot-stomping soul food. Come watch this show in Branson and you can bet it is even better. The show that seems custom-made for the Branson stage, is beautifully delivered by a talented cast. The colorful characters of the play come to life like no other show in Branson has ever presented. The story of the play is set in the Mt. Pleasant Baptist country church in the Smoky Mountains of North Carolina in 1938. During that time, the Sanders Family Singers have been invited by the young, enthusiastic Pastor Oglethorpe to perform at the church’s first Saturday Night Gospel Sing. With eagerness to appear in the eyes of the small congregation, the Sanders Family proves, that they can perform, much to the audience’s delight. Since the show is now in Branson, the audience becomes the congregation, that sing along 30 classic gospel songs. In this show, you’ll hear old Gospel favourites and you will laugh helplessly as you watch the antics of actors who portray the black sheep in the families. The unique combination of music, comedy, and message makes this unique entertainment show in Branson at its best. You’re sure to laugh unceasingly, maybe shed a tear or two, and most of all, you’re sure to have a blast when The Sanders Family Singers take over the Mt. Pleasant Baptist Church choir in the charming, hilarious, and completely enchanting Smoke on the Mountain. This show in Branson will make you feel being a part of the play as you watch the Smoke On The Mountain at the Little Opry Theatre in Branson’s IMAX Entertainment Complex.